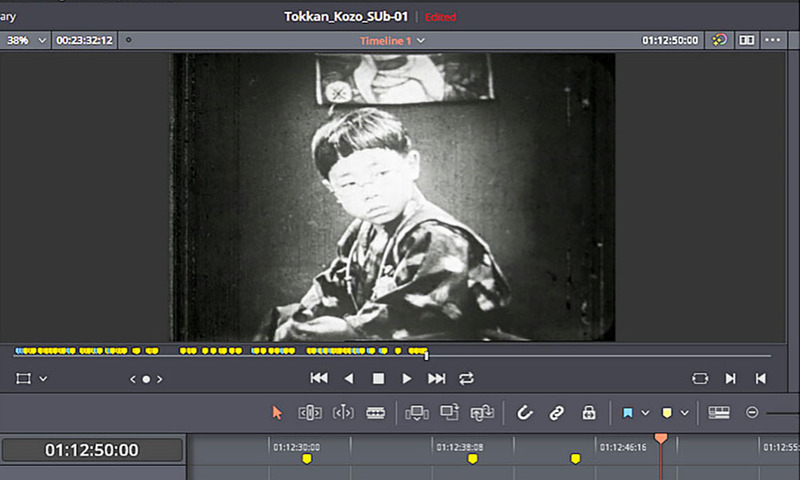 The Digital Scholarship Lab at River Campus Libraries used a program called DaVinci Resolve to help process surviving 9.5 mm footage of Tokkan Kozo, a 1929 Japanese silent film. Tokkan Kozo is a 1929 Japanese silent film inspired by a classic O. Henry short story about a child kidnapping gone comically awry. The film was believed lost until partial 9.5mm versions surfaced in 1988 and again in 2015. Now, thanks to a collaboration involving Josh Romphf and Clara Auclair at the Digital Scholarship Lab at River Campus Libraries; Joanne Bernardi, professor of Japanese and film and media studies; the George Eastman Museum; and the Toy Film Museum in Kyoto, Japan, the surviving footage of Tokkan Kozo can be seen as an English language digital cinema package, or DCP. The film will have its US premiere on Tuesday, Dec. 4 at the George Eastman Museum’s Dryden Theatre, along with another film (Passing Fancy, 1936) by the same director, Yasujiro Ozu. Tokkan Kozo was screened for the first time recently at the Pordenone Silent Film Festival in Pordenone, Italy. Bernardi also gave a talk about the film and its collaborative restoration. The US premiere of this newly restored film, now available as a digital cinema package that can be screened in movie theaters thanks to the efforts of the Digital Scholarship Lab and others to bring this lost film back to life. “We were able to make the DCP here at the University of Rochester because Josh and Clara are both graduates of the Selznick Graduate Program in Film Preservation,” Bernardi says. The collaborative graduate program with George Eastman Museum is housed in the Department of English. Digital cinema packages represent a relatively new technology that emerged around 2010. It “has become the standard for film distribution since the industry has moved away from 35mm film projection,” writes Romphf, a programmer with the Digital Scholarship Lab. A digital cinema package is less expensive to produce, and the footage does not become worn like 35mm film after repeat showings. “This is the first time the University was represented with a contribution to this festival’s programming, thanks to the Digital Scholarship Lab,” Bernardi says. She also credits a mobility travel grant from Arts, Sciences & Engineering that enabled her to visit the Toy Film Museum—where the original 9.5mm film used in this restoration is housed— to translate the intertitles. In silent films, intertitles are pieces of filmed, printed text that are edited into the footage at various points to help tell the story. Tokkan Kozo (A Straightforward Boy), was Ozu’s second movie featuring six-year-old Tomio Aoki, whose “headstrong mischievousness brought him fame as a child actor,” Bernardi writes in notes for the festival. As in O. Henry’s tale, Aoki’s character proves altogether too much for his kidnappers to handle. Bernardi has had a decades-long interest in uncovering a side of Japan that few Westerners knew about—a cosmopolitan, modernizing nation that was already making its mark in film and experiencing a boom in tourism well before World War II.